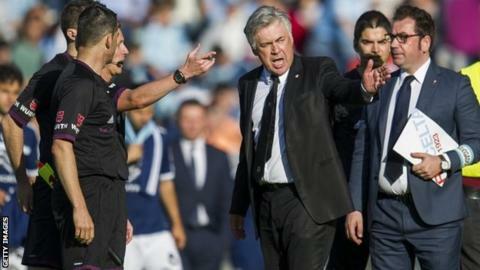 Real Madrid boss Carlo Ancelotti says he does not care who wins the league after his side's slim hopes were ended. Sunday's 2-0 defeat by Celta Vigo means the winners of Saturday's match between Barcelona and Atletico Madrid will win the title, with a draw enough for the latter. "I don't care who it is," the Italian said. "I'm not interested either way. "We have a different issue and that is to prepare well for the Champions League final." Real, who face Atletico in the Champions League final, are now five points off their city rivals after failing to win any of their last three games. Had they beaten Valencia, Real Valladolid and Celta Vigo, they would have topped the table going into the final day. But former Chelsea boss Ancelotti, who replaced Jose Mourinho in the summer, said: "I don't think we threw the league away. "It is true though that we haven't played well in the last three games. After the semi-finals our intensity dropped and we've been made to pay dearly. "Now is not the time to look at what we have failed to do well. We have to look forwards, recoup our energy and our players in order to prepare well for the final. "It is not my concern if the season is considered a good one or a bad one. We have a great chance to make a dream come true for Real Madrid and we'll do our best to make it happen. Only then will we look back at the season." Cristiano Ronaldo and Gareth Bale both missed the Celta game but Ancelotti says they will be fit for the Lisbon final. "Bale is not 100%. He got a knock, but I decided not to risk him, especially when I could have put him on," he said. "I wanted to avoid any problems. Cristiano Ronaldo underwent treatment this morning and is almost fully recovered. We have 15 days to prepare for the match and I think they'll be completely fit for the final."